Interoperability is a topic being explored by many blockchain startups, researchers, and developers in an effort to connect siloed blockchain networks together and enable cross-chain transfers of value or data. Interoperability is also at the core of what we regard as Aergo’s N-tier architectural design which combines public and private blockchain technology to bring together the best of many worlds, and give enterprises flexibility in designing dApps without compromising key elements of decentralization and data integrity. For our future clients and our future customers to transfer value or data across blockchains, secure communication between these networks is required. We call the process of blockchains communicating with one another asset bridging. Asset bridging requires efficient mechanisms to authenticate and verify the state of different chains. One of the ways to achieve this is through smart contracts verifying Merkle proofs of other blockchain states (in this case, an asset transfer request). These proofs need to be lightweight and efficient to verify, for gas efficiency of the smart contract. Ethereum uses a modified Merkle Patricia tree to authenticate state data. However, Ethereum’s Patricia tree is hexadecimal whereby each node contains 16 children, which is less efficient and harder to work with than a binary tree. Achieving the speed and performance needed for commercial use of blockchain requires that state authentication be as efficient as possible, which drove our research into the sparse Merkle tree. Our design iterations first led us to implement a standard sparse Merkle tree. The standard sparse Merkle tree is a hash tree that can be updated in constant time. However, we found that it was still too slow and would not give us the throughput we need in the Aergo platform. The main reason for this limitation in the standard sparse Merkle tree is that values are stored at height 0 in the tree, which requires 256 hashing operations to update one key. So, in an effort to increase throughput on the Aergo chain, one of our developers, Pierre-Alain Ouvrard, modified the sparse Merkle tree accordingly and open-sourced our implementation. Aergo StateTrie will enable fast and efficient state authentication. In this post, I provide a comprehensive overview of what it is, what its features are, and how to use it. Aergo StateTrie is a modified sparse Merkle tree implementation which stores values at the highest subtree containing only one key. The benefit achieved from this is that, on average, in a tree containing N random keys, just log(N) hashes are required to update a key in the tree. Therefore the trie height is on average log(N), making inclusion and non-inclusion proofs shorter. A sparse Merkle tree is a tree that contains a leaf for every possible output of a cryptographic hash function. Figure 1. 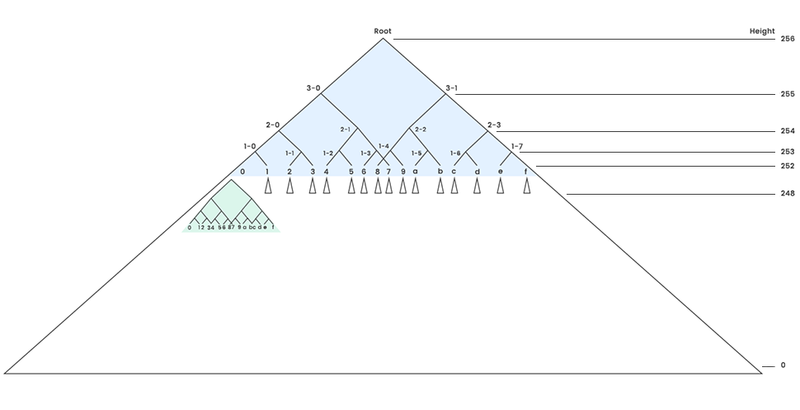 An example sparse Merkle tree of height=4 (4-bit keys) containing 3 keys. The 3 keys are shown in red and blue. Default nodes are shown in green. Non-default nodes are shown in purple. The values (non-default keys) are stored at the leaf of the tree at height 0. If the default value is D0, then every default node at height 1 will have a value of D1 = Hash(D0,D0). The root of an empty tree is the default hash of height 4. When keys are inserted in the trie, the value of the leaf node changes from the default value (D0) to the specified value, and only the modified part of the tree has to be recomputed. For example, adding the red value to a tree already containing the blue keys only requires the computation of H1, H2, H3, and Root to get the new root of the tree. The red value was added to the left side of the tree, so h3 is not modified. For a hash function outputting 256 bits, the tree has 256 levels; or in other words, 2²⁵⁶ possible keys, which makes it impossible to represent. The tree is said sparse because if the tree contains only random keys (sparsely distributed), then most of the nodes it contains have default values that are determined based on the height of the node. We can, therefore, simulate the tree by only storing the default nodes once, and then also the rest of the non-default nodes. For a more in-depth overview of the SMT and its Merkle proofs, see this post. To reduce the number of hashing operations necessary to update a key in a tree, we created leaf nodes. A leaf node is stored at the highest subtree that contains only 1 non-default key. So, the hashing of the tree starts from the height of leaf nodes instead of height 0. If the tree contains N random keys, then on average, leaf nodes will be created around height = log(N). Another benefit of the Aergo Trie is that Default Hashes are no longer necessary. We add the following property to the hash function : H(0,0) = 0. Looking at Figure.2, D1 = Hash(D0,D0) = Hash(byte(0),byte(0)) = byte(0) = D2 =…= D256. Figure 2. H3 was the highest subtree containing only one key: the red one. So, it will take its place in the modified sparse Merkle tree. The blue keys are not sparse as they diverge only by their last bit, so they keep the same position at the bottom of the tree. This shows the importance of using random keys in a sparse Merkle tree. Using a binary tree gives us very simple and easy-to-use Merkle proofs, unlike a Patricia tree, where a Merkle proof is composed of all the nodes in the path of a key. Since each node in a Patricia tree has 16 children, the quantity of data is larger and not as straightforward to verify as it would be in binary. In the above example, the Merkle proof of the red key is composed of the node in red: [h3]. Notice that this proof is much shorter than the one in the previous example ([D0, D1, D2, h3]) because values are not stored at height 0. The verifier of the proof will compute Hash(LeafNode, h3) and check that the Root is as expected. Compressed Merkle proofs: Like in the standard sparse Merkle tree, Merkle proofs can also be compressed. We can use a bitmap and set a bit for every index that is not default in the proof. The proof that the blue LeafNode1 is included in the tree is: [LeafNode2, D1, D2, LeafNode]. This proof can be compressed to 1001[LeafNode2, LeafNode]. The verifier of the compressed Merkle proof should know to use D1 to compute h2 because the second index of the bitmap is 0, and D2 for the third proof element, etc. prove that the Leaf node of another key is included in the tree and is on the path of the non-included key. or prove that a default node (byte(0)) is included in the tree and is on the path of the non-included key. For example, a proof that key=0000 is not included in the tree is a proof that LeafNode is on the path of key and is included in the tree. A proof that key=1111 is not included in the tree is a proof that D2 is on the path of the key and is included in the tree. When a leaf is removed from the tree, special care is taken by the Update() function to keep leaf nodes at the highest subtree containing only 1 key. Otherwise, if a node has a different position in the tree, the resulting trie root would be different even though keys and values are the same. So, when a key is deleted, Update() checks if it’s sibling is also a leaf node and moves it up until the highest subtree root containing only that non-default key. When storing each node as a root with 2 children, the quantity of nodes to store grows very quickly and a bottleneck happens due to multiple threads loading nodes from memory. A hex Merkle tree would solve this problem as each key has 16 children and a smaller height of 64 (256/4), though as we said earlier, we need the tree to be binary. We can achieve the same features of a hex tree by using node batching. Instead of storing 2 children for one node, we store the subtree of height 4 for that node. A tree of height 4 has 16 leaves at height 0 (like hex). So, the value of a node is an array containing all the nodes of the 4-bit tree. The children of a node at index i in the tree can be found at index 2*i+1 and 2*i+2. For example, to get the children of node 3–0 at index id=1 in the array, we can access the left child 2–0 at index (2 * id + 1) = index 3 and the right child 2–1 at index (2 * id + 2) = index 4. To each node, we append a byte flag to recognize the leaf nodes. Since the nature of Root is not know ahead of time, the byte flag is stored at the first index of the nodes array. Figure 4. A visual representation of node batching. The first batch is blue, and all 16 leaves of a batch are roots to other batches (green). A batch contains 30 nodes. To store the batch in the database, it is serialised with a bitmap which allows us to store only the non default nodes. The bitmap is 4 bytes = 32 bits long. The first 30 bits are for the batch nodes, the 31st bit is the flag to make a shortcut batch (a batch that only contains a key and a value at 3–0 and 3–1), the 32nd bit is not used. Concurrent update of the height 4 subtree without the need for a lock. Instead of updating keys one by one, it is possible to update any number of keys with one update call that will concurrently update different parts of the tree. The keys should be sorted in an array, and the corresponding values should be at the same index in a separate array (see Usage). To delete a key from the tree, simply set it’s value to the default value byte(0). When creating an empty tree, set root to nil. A nil root means that it is equal to the default value of its height. Use a custom hash function or use the Hasher in utils and specify a database if you plan to commit nodes. ‘keys byte’ is a sorted array of keys, ‘values byte’ contains the matching values of keys. Update will recursively go down the tree and split the keys and values according to the side of the tree they belong to: multiple parts of the tree can be simultaneously updated. If update is called several times before Commit, only the last state is committed. AtomicUpdate updates the tree with sorted keys and values just like Update. But unlike update, if AtomicUpdate is called several times before Commit, all the intermediate states from AtomicUpdate calls will be recorded. This can be useful when authenticating the state of each block, but not committing to the database right away. Get the value of a key stored in the tree, if a key is default, i.e., not stored, return nil. Commit the updated nodes to the database. When update is called, the new nodes are stored in smt.db.updatedNodes. Commit then stores to disk. StageUpdates loads the updated nodes into the given database transaction. It enables the commit of the trie with an external database transaction. Use the Stash function to revert the update without committing. When revert is called, the trees to rollback (between the current tree and toOldRoot) are deleted from the database. MerkleProof creates a Merkle proof of inclusion/non-inclusion of the key. The Merkle proof is an array of hashes. If the key is not included, MerkleProof will return false along with the proof leaf on the path of the key. MerkleProofPastcreates a Merkle proof of inclusion/non-inclusion of the key at a given trie root. This is used to query state at a different block than the latest one. Verifies that the key-value pair is included in the tree at the current Root. Verify a proof of non-inclusion. Verifies that a leaf(proofKey, proofValue, height) or an empty subtree is on the path of the non-included key. Verifies a compressed proof of inclusion. ‘length’ is the height of the leaf key-value being verified. Verify a compressed proof of non-inclusion. Verifies that a leaf (proofKey, proofValue, height) or an empty subtree is on the path of the non-included key. Communication across distinct blockchain systems is a functionality that will be needed for the future of distributed networking and enterprise blockchain. Facilitating chain to chain transfers of value or data in business require efficient means of authenticating state. The standard sparse Merkle tree didn’t quite meet the performance standards we had in mind, so we’ve modified it and open-sourced our implementation. Aergo StateTrie will be used in the Aergo platform for fast and efficient authentication of state in the process of asset bridging and other applications relying on secure state verification like wallets and light clients. This post is available in Korean here. Board Member of the AERGO Foundation and CTO at Blocko Inc.